Here are some easy methods for cooking mushrooms. Fresh mushrooms are truly a cook's best friend. Whether you need just a little something to dress things up or add a whole new dimension of flavor, your answer is mushrooms. There is no need to peel mushrooms. The only trimming they may need is the stem end, if it's dry, or the tough stem portion of Shiitakes or the root of the Portabella. All other mushroom stems may be prepared along with the caps. For each eight ounces of mushrooms, melt one tablespoon butter or heat one tablespoon of oil in a large skillet. Add mushrooms. Cook and stir until golden and the released juices have evaporated, about five minutes. Don't overcrowd the skillet or the mushrooms will steam rather than brown. Mushrooms cook extremely well in the microwave. Simply clean and cook as follows: Put eight ounces thickly sliced mushrooms in a microwaveable bowl (no oil or butter needed); cover and cook on HIGH (100% power) for two to three minutes stirring once. Place mushrooms in a shallow baking pan, Toss with a little oil and roast in a 450ºF oven, stirring occasionally until brown, about 20 minutes. Use about one tablespoon of oil for each eight ounces of mushrooms. 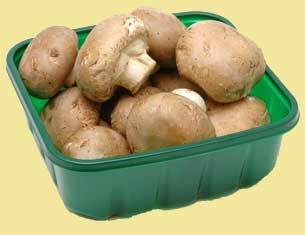 This is the preferred method for larger capped mushrooms like Portabellas and Shiitakes. Lightly brush caps and stems with oil to keep them moist, and season with salt and pepper. Grill or broil 4 to 6 inches from heat source for 4 to 6 minutes on each side, brushing again once or twice. Mushrooms are very similar to meats and other vegetables. Virtually any and all seasonings go well with mushrooms. If serving as a side dish, use seasonings compatible with the main dish. This article comes from The Mushroom Council site: the definitive guide to mushrooms with mushroom recipes and in-depth information on fresh gourmet mushrooms, including selected exotic mushrooms. This site is a mine of information if you want to learn about mushrooms, grow them or eat them! "One of the great vegetables in my opinion - and I have never come across anyone who dislikes them!"